Zion Market Research has published a new report titled “Blood Glucose Monitoring System Market by Product (Self-Monitoring and Continuous Glucose Monitoring Devices), by Testing Site (Fingertip Testing and Alternate Site Testing), by Indication (Type-I Diabetes, Type-II Diabetes, and Others), and by End-User (Hospitals, Clinics, and Homecare): Global Industry Perspective, Comprehensive Analysis, and Forecast, 2017 – 2024”. According to the report, global blood glucose monitoring system market was valued at approximately USD 12.23 billion in 2017 and is expected to generate around USD 18.87 billion in revenue by the end of 2024, growing at a CAGR of around 5.1% between 2018 and 2024. Blood glucose monitoring is a part of the standardized care for diabetes patients. It helps in monitoring and controlling the glucose level in diabetic individuals and impaired glucose tolerance. The demand for blood glucose monitoring systems is increasing due to a rapid increase in the prevalence of diabetes and rapid adoption of sugar surveillance system to control diabetes. The blood glucose monitoring system market is segmented on the basis of product type, testing site, indication, and end-user. Based on product type, the blood glucose monitoring system market is segmented into self-monitoring devices and continuous glucose monitoring devices. Self-monitoring devices segment is further sub-segmented into blood glucose meters, lancets & lancets devices, and testing strips. The self-monitoring devices segment is dominating the global market for blood glucose monitoring system, owing to the rapid product development, the requirement of less blood sample, and enhancement in its accuracy. The rising adoption of minimally invasive surgeries is expected to fuel the growth of continuous glucose monitoring devices segment. On the basis of testing site, this market is segmented into fingertip testing and alternate testing site. The fingertip testing segment is anticipated to dominate the market due to site accuracy and high reliability on the fingertip testing results. Based on the indication, the blood glucose monitoring system market is segmented into type-I diabetes, gestational diabetes, and type-II diabetes. Type-I and type-II diabetes are further sub-segmented into adult and pediatrics. The increase in the prevalence of type-II diabetes among the three types of applications is fueling the growth of the use of blood glucose monitoring system for monitoring type-II diabetes. Therefore, type-II diabetes segment is anticipated to dominate the application segment of blood glucose monitoring devices market. The end-user segment includes hospitals, clinics, and homecare. Homecare segment is anticipated to dominate the market due to an increase in diabetic population and increasing preference for less or minimally invasive technologies that can be used at home. Europe, Latin America, North America, Asia Pacific, and the Middle East & Africa are the regional segments of the global market of blood glucose monitoring system. North America is anticipated to dominate the market in the forecast period due to rise in the initiatives undertaken by the government for prevention and treatment of diabetes with the help of leading players of the region. This rise in the number of people, from all age groups, suffering from diabetes is mainly driving the demand for blood glucose monitoring systems in Europe. In the forecast period, Asia Pacific is expected to follow North America and Europe due to the increase in the population suffering from diabetes. 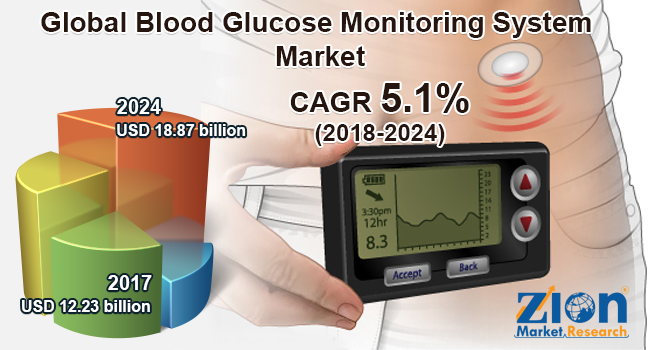 The increase in aging population, lifestyle-associated changes, rapid awareness regarding diabetes, and rapid urbanization are some of the factors fueling the growth of the blood glucose monitoring system market in the Asia Pacific region. Latin America and the Middle East & Africa are expected to show a slow growth rate in this market during the forecast period. Increase in the prevalence of diabetes and the rapid increase in awareness about the investment in disease treatment are expected to fuel the growth of the blood glucose monitoring system market in these regions. The main players in the global market for blood glucose monitoring system are Abbott Laboratories, Novo Nordisk A/S, Hoffmann-La Roche Ltd., Sanofi, Medtronic, Nova Biomedical, B. Braun Melsungen, Terumo Corporation, ARKRAY Inc., and Becton, Dickinson, and Company. The major companies focus on the introduction of new innovative technologies. In 2016, Roche launched the innovative Accu-Chek that monitors the blood glucose level with ease.